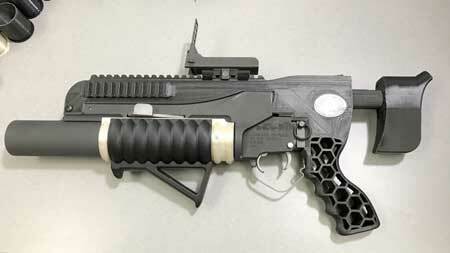 (Nanowerk News) While advances in additive manufacturing offer potential breakthroughs in prosthetic arms or jet engine parts, 3D printing, as it is known, may also accelerate weapons proliferation. A new RAND Corporation paper ("Additive Manufacturing in 2040: Powerful Enabler, Disruptive Threat") suggests additive manufacturing could benefit military adversaries, violent extremists and even street criminals, who could produce their own weapons for use and sale. 3D printing technology is also susceptible to hacking, which could allow sabotage by hackers who maliciously instruct 3D printers to introduce flawed instructions or algorithms into mission-critical parts of airplanes, according to the paper. "Lone-wolf attacks may become more lethal when individuals have ready access to 3D printers," said Trevor Johnston, lead author and an associate political scientist at RAND, a nonpartisan research organization. "Even in countries like the United States, where gun control laws have done little to restrict access to semi-automatic weapons, additive manufacturing could increase the risk of violence and murder." Additive manufacturing may also indirectly support the survival and rise of pariah states like North Korea, which could avoid the costs of withdrawing from the international community by producing complex items domestically, skirting international sanctions. From an economic perspective, by decentralizing manufacturing individuals and firms may choose to produce locally rather than importing goods. 3D printing could therefore weaken international connections currently sustained by complex, multi-country supply chains, the authors conclude. That in turn may create upheaval in labor markets - and subsequent social conflict. "Unemployment, isolation and alienation of middle and low-skilled laborers may be exacerbated by additive manufacturing, potentially leading to societal unrest in both developed and developing countries," said Troy Smith, an author on the paper and an associate economist at RAND. "The potential security implications of large masses of unemployed, disconnected people are substantial." The authors posit that the relative risk and cost of future threats will depend in part on the evolution and regulation of additive manufacturing hardware (printers), raw materials and software (intellectual property). Threat prevention will be more effective if focused on material controls. By limiting supplies of rare or dangerous raw materials, regulators can at least ensure that some of the most destructive weapons (e.g., nuclear or dirty bombs) do not become readily accessible. By monitoring online communities, law enforcement may be able to curtail digital exchanges of lethal creations. Unfortunately, the efforts of domestic law enforcement may be ineffectual on this front, the authors write. Alternatively, law enforcement may themselves hack additive manufacturing software to disrupt potential attacks or limit their destruction. In all likelihood, these preventive measures will not stop the spread of new risks connected to 3D printing, according to the paper. There is little that regulation, export controls, treaties and law enforcement can do to fully prevent a motivated, well-financed, organized actor from eventually acquiring new technology. As such, policymakers should particularly focus on measures that mitigate the potential impact and cost of these future threats. While fraught with risks, policymakers should begin to address the hard security questions that additive manufacturing will bring.